Each year, the Bennington County Solid Waste Alliance holds two household hazardous waste collection events. One is held in the Town of Bennington and the second in the northern part of the county, and both are open to residents and small businesses of the 13 towns in the Alliance to dispose of substances that are toxic, corrosive, and poisonous or that have similar warnings. Residents and businesses may also take materials to the Rutland County Solid Waste District at their facility on Gleason Rd. in Rutland. The facility is open from 7 AM to 3 PM Monday through Saturday. Residents and businesses must pay for disposal of these materials. Contact Deane Wilson at 802-775-7209 to schedule a time and date and for more information. Household: Drain cleaner, floor cleaner, oven cleaner, toilet cleaner, rug and upholstery cleaners, furniture or metal polish, bleach, ammonia, disinfectants, air fresheners, photography chemicals, chemistry sets, moth balls, naphtha, camphor, nail polish remover, perfume, alcohol, appliances with Freon. Garage: Gasoline, kerosene, antifreeze, wiper fluid, brake or transmission fluid, engine degreaser, carburetor cleaner, radiator flusher, car wax/polish, driveway sealant. Workbench: Oil-based paint, stains, varnishes, linseed oil, fillers, putty, adhesives, resins, solvents, rust treatments, acids, hydrogen peroxide, roofing tar, tar remover, creosote. Yard: Pesticides, herbicides, fungicides, other poisons, chemical fertilizers, pool chemicals, septic system additives, animal repellants, no-pest strips, and flea control products. Mercury Containing Items: Mercury items, such as thermometers and some thermostats should be taken to HHW events. Fluorescent tubes and CFLs are accepted at many retailers and some transfer stations. Appliances with Freon: Refrigerators, air conditioners and dehumidifiers are accepted at most transfer stations for a fee. To reduce household hazardous waste, try to purchase only what you need and try to use all the material if at all possible. Visit http://dec.vermont.gov/waste-management/solid/materials-mgmt/HHW for more information. 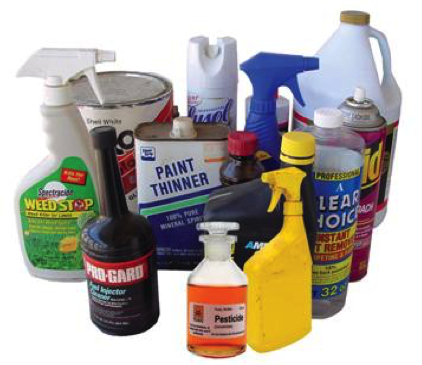 Also, see if any of the Alternatives to Household Hazardous Waste will work for you.